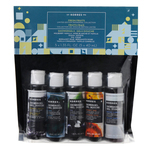 Complete regimen provides a superior shave, deep cleaning and delivers oil-free hydration and sun protection. 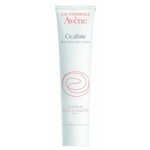 Also reduces redness, bumps and irritation to leave skin soft and smooth. 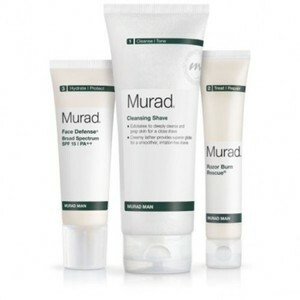 Murad Man is a brand of doctor-developed formulas designed to provide powerful, yet simple, solutions to concerns specific to men's skin. This patented approach provides a comfortable shave and deep cleans as it inhibits irritation and razor bumps for skin that feels and looks its healthiest. 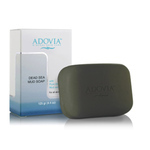 This patented antioxidant-rich cleansing formula delivers a closer, smoother, more comfortable shave. 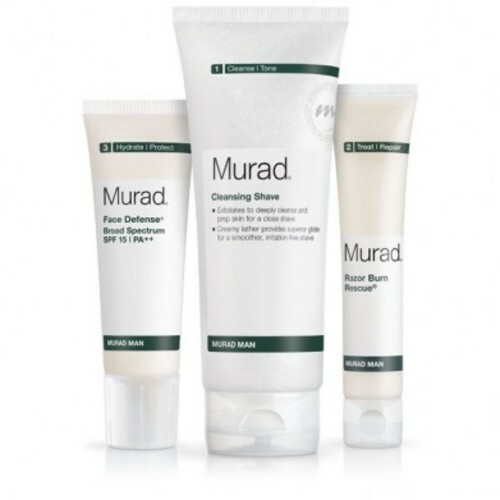 Features Murad's exclusive Beard Softening Complex and Mushroom Enzyme exfoliants to uncover stubborn facial hairs and prepare skin for a superior shave. Fights razor burn, shaving irritation, razor bumps and ingrown hairs by infusing skin with a unique blend of healing antioxidants and redness reducing anti-inflammatories while Glycolic Acid clears irritating dead skin and debris from hair follicles. Every day after shaving, apply a small amount onto face and neck. For severe razor burn use twice a day until the area clears, then proceed to use only after shaving. For optimal results, follow with Face Defense SPF 15. Water (Aqua), Sodium Cocoyl Isethionate, Glyceryl Stearate SE, Cetyl Alcohol, Stearic Acid, Prunus Armeniaca (Apricot) Kernel Oil Polyquaternium-44, Panthenol, Fomes Officinalis (Mushroom) Extract, Chitosan Ascorbate, Melia Azadirachta Leaf Extract, Tocopheryl Acetate, Sodium PCA, Betaine, Sorbitol, Glycine, Alanine, Proline, Serine, Threonine, Arginine, Lysine, Glutamic Acid, Zinc Gluconate, Butylene Glycol, PEG-90M, Xanthan Gum, Phenoxyethanol, Methylparaben, Propylparaben, Citronellol , Geraniol , Linalool, Geranium Maculatum Oil, Melaleuca Alternifolia (Tea Tree) Leaf Oil. 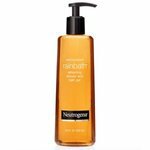 Water (Aqua), Hamamelis Virginiana (Witch Hazel) Water, Glycolic Acid, Butylene Glycol, Caprylic/Capric Triglyceride, Isopropyl Palmitate, Sodium Hydroxide, Isostearic Acid, Cetyl Alcohol Cyclopentasiloxane, Cetearyl Alcohol, Dicetyl Phosphate, Glyceryl Stearate, PEG-100 Stearate, Ceteth-10 Phosphate, Zinc Gluconate, Chitosan Ascorbate, Sodium PCA, Betaine, Sorbitol, Glycine, Alanine, Proline, Serine, Threonine, Arginine, Lysine, Glutamic Acid, Melia Azadirachta Leaf Extract, Tocopheryl Acetate, Dimethicone, Bisabolol, Allantoin, Panthenol, Sorbitan Stearate, Sclerotium Gum, Tetrasodium EDTA, Phenoxyethanol, Propylparaben, Methylparaben, Citral , Citronellol, Geraniol, Limonene, Linalool, Geranium Maculatum Oil, Melaleuca Alternifolia (Tea Tree) Leaf Oil, Fragrance (Parfum). 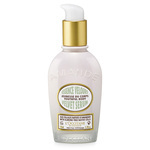 Active: Avobenzone (2.50%), Octinoxate (7.50%), Oxybenzone (2.00%). Inactive: Water (Aqua), Butylene Glycol, Isononyl Isononanoate, Pentylene Glycol, Neopentyl Glycol Diethylhexanoate, Bis-PEG/PPG-16/16 PEG/PPG-16/16 Dimethicone, Dicaprylyl Ether, Cetearyl Alcohol, PEG-100 Stearate	, Glyceryl Stearate, Urea, Yeast Amino Acids, Trehalose, Inositol, Taurine, Betaine, Phospholipids, Retinyl Palmitate, Tocopheryl Acetate, Ascorbyl Palmitate, Neopentyl Glycol Diisostearate, Caprylic/Capric Triglyceride, Zinc Gluconate, Panthenol, Dimethicone, Acrylates/C10-30 Alkyl Acrylate Crosspolymer, Disodium EDTA, Aminomethyl Propanol, Polysorbate 80, Phenoxyethanol, Caprylyl Glycol, Chlorphenesin, Linalool, Geraniol, Citronellol, Melaleuca Alternifolia (Tea Tree) Leaf Oil, Pelargonium Graveolens Flower Oil Allergen.